The mercury is soaring in Delhi. I am on liquids most of the time. I have been feeling pukish and sick all around. Ah….the heat!! If I had a super power, I would want it to be power to control temperature. Oh, you lovely Delhi winters- I miss you!! Would you guys tell me what are your superpowers?? Talking about superpowers, I have one superpower to myself. I inspire lovely people like you with my Blog. Yes! 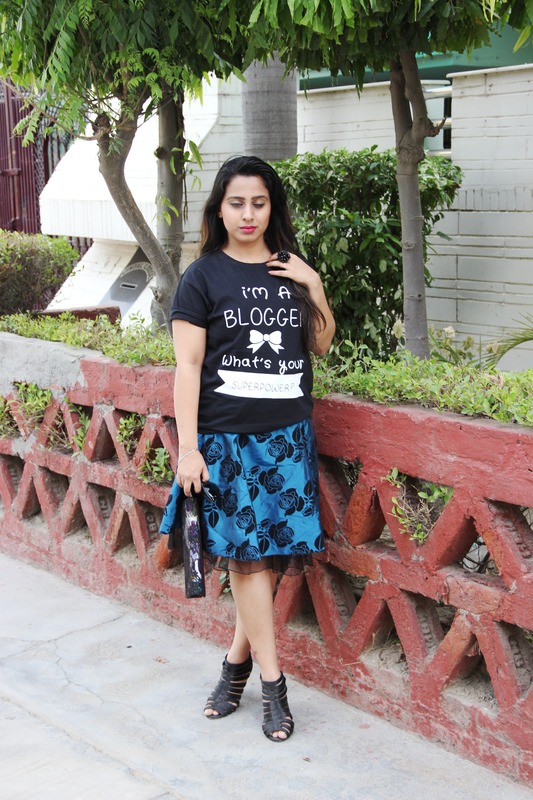 I am a Blogger!! That is my Superpower. I’ve heard that words are the strongest weapon ever build by man. 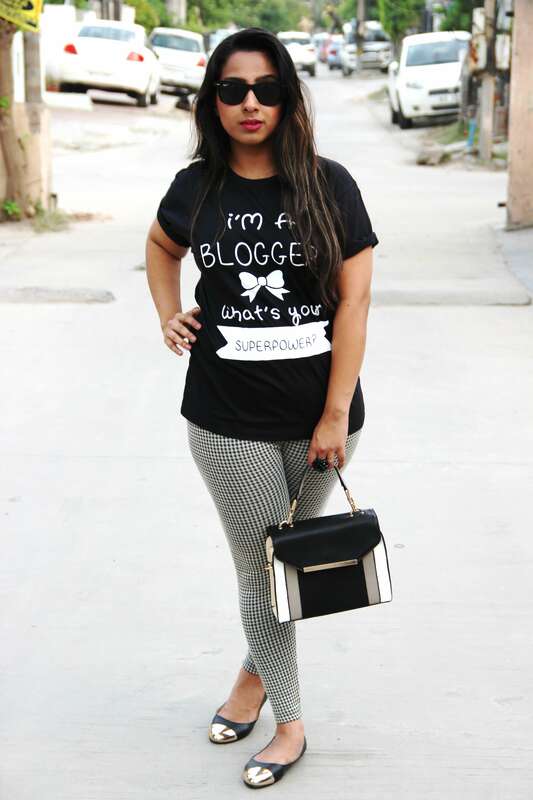 So yes, I’m the Queen of words and Blogging is my Superpower! 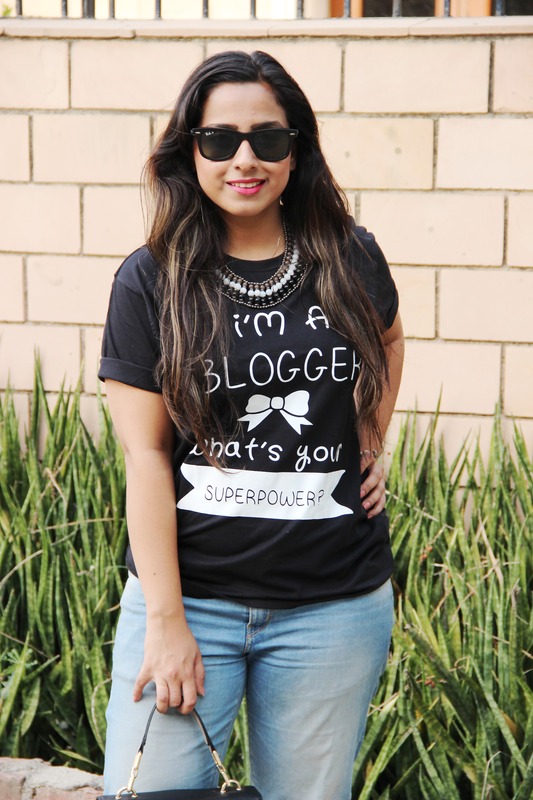 I was on the scout for a T-shirt with prints related to Blogging. BINGO! 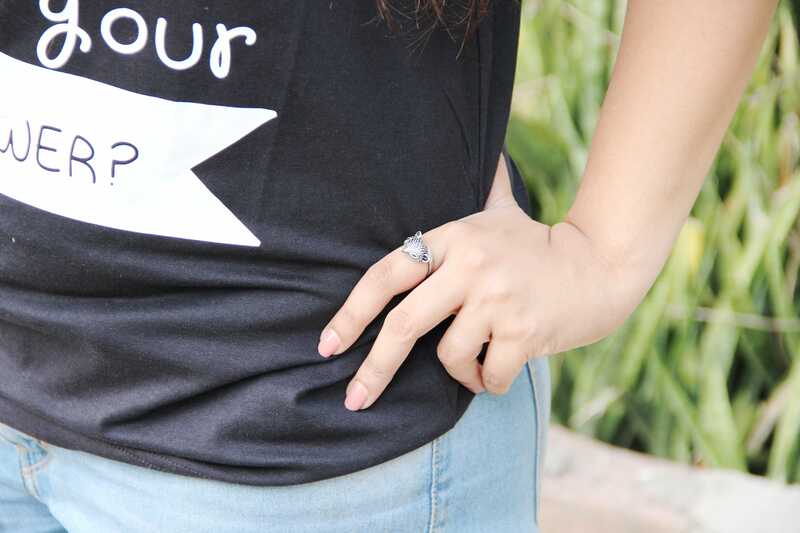 LBug Clothing happens to me. I went to their website and ordered all what I wanted. They have an amazing collection and unbelieveable cheap prices. They even do Custom made T-shirts. (Keep this is mind for a lil secret later!!) 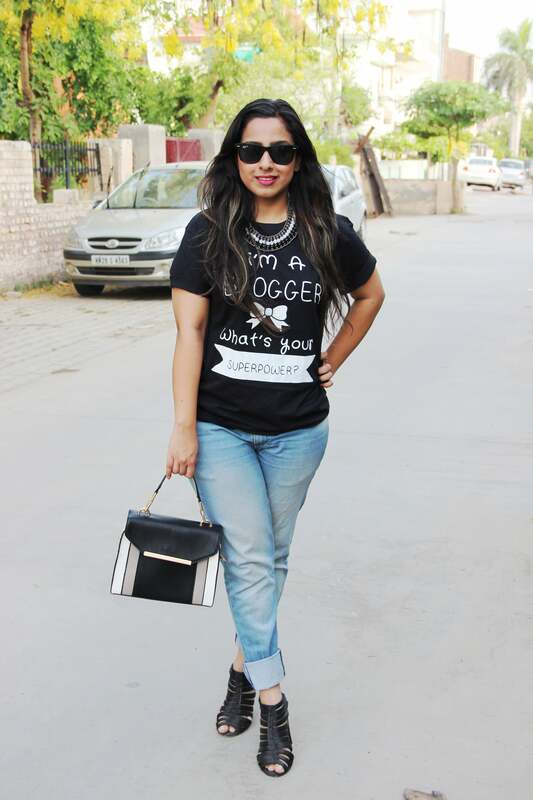 I got this lovely T-shirt from LBug Clothing that I wanted to style in different ways. 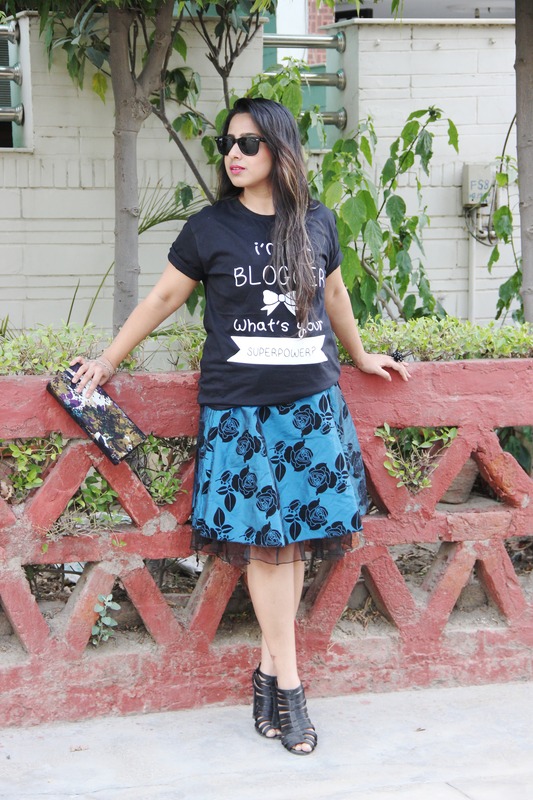 So let me show you how I styled this T-shirt. I kept the look simple with a Boyfriend jeans. 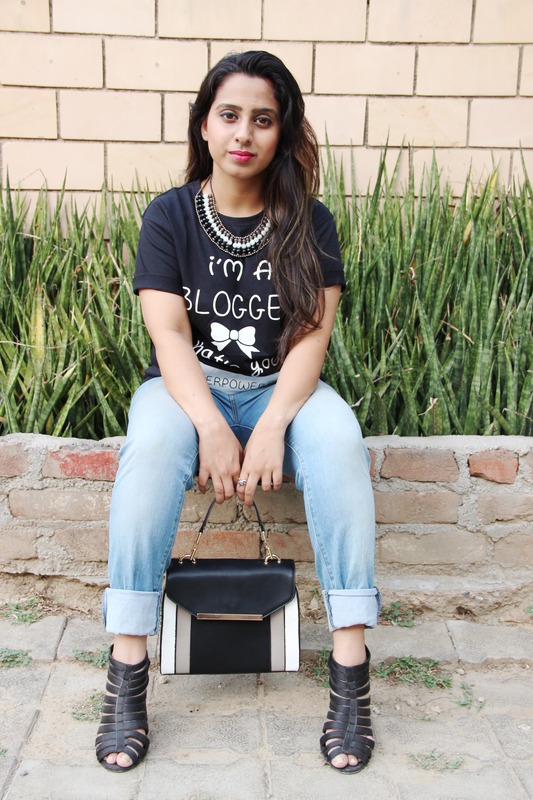 A statement necklace to show the glam side of a simple outfit! Adding Glam to the outfit, the gladiator Heels makes the look perfect for a shopping day or girls lunch date. A Ray-ban wayfarers to keep my eyes protected and a Sling bag in Monotones to carry around. This lovely fox ring is my current favorite. Its always a Pop of Color that keeps it going. I wanted to Doll-up the T-shirt. Wearing it over a Cocktail dress was the perfect way to dress out a simple T-shirt into a Fashion Blogger category. The deep blue Satin dress has been my favorite ever since my mom gifted it to me. This chunky cocktail ring and lace work clutch gives it a high-class glam. I would wear this to an informal dinner party or maybe even a date! Monotones are here to stay and summers are no exception. Guess which other style is just here? The lovely Gingham Print! So lets combine up a look with these styles. 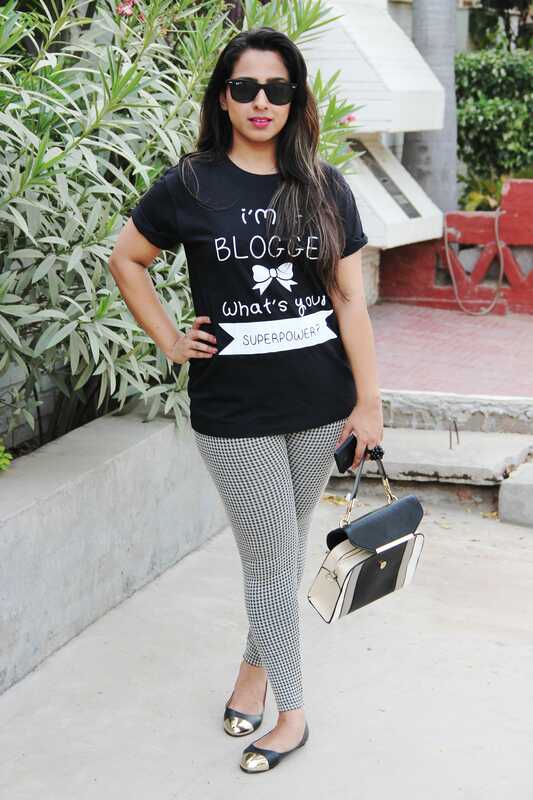 Wearing this T-shirt with a Gingham print leggings. The monotone Sling serves me here along with a plain flats. The gold tip at the flats and the gold embellishment in the Sling bag gives that right pop out of the Monotone too. Hope you loved all the looks! I’m waiting to hear your superpower. Comment below or message me what your Superpower is. Product Review- Iraya Anti Acne Gel First Giveaway- L Bug Giveaway. Enter here!! Love your look. My superpower at any time of the year has to be my hobby, Photography! Keep it coming Mitz! My superpower is general knowledge. As there is no one in this world who knows everything but I am always looks forward to know about the things which I don’t know and try to grab maximum from it. My super power is speaking! Yes i do talk a lot and love to talk about anything under the sun! I was into public speaking from school times and still have been continuing the same in college and professionally in any meetings of the institute of architects or just when i am with friends.. take any moment of my life, I DO TALK.. and A LOT!! I talk in my current profession too! I teach, and that involves a lot of talking! My mom calls me FM radio and wants me to pause at least once in a while! My super power is multitasking!